My take: I thought The Hurricane Sisters quite different in tone compared to The Last Original Wife but I still liked it. Some eccentricities aside, the Waters family is not that different from a lot of families. They accept and protect their own but sometimes they aren’t so nice to each other. Underneath it all they love each other and will defend them to the end. At the forefront of the novel are the rather naive Ashley, her long-suffering mother Liz, and the matriarch Maisie who doesn’t tiptoe around anyone. Big secrets figure into the plot but rest assured all will be dealt with by the last page. 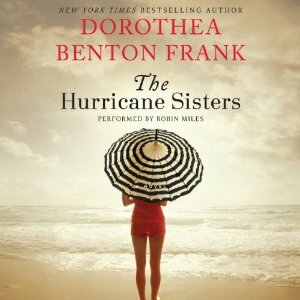 The Hurricane Sisters is just the second book by Dorothea Benton Frank I’ve read. I look forward to catching up with her backlist. As in The Last Original Wife, Robin Miles’ narration was great and made the book even more enjoyable. I loved her performance.